Many women already use yoga to prevent and alleviate menstrual pain. Yoga is today regarded in the West as an holistic approach to health and only recently it has been classified by the National Institutes of Health as a form of Complementary and Alternative Medicine (CAM). Yoga combines physical exercises, mental meditation, breathing techniques and a specific lifestyle to strengthen the muscles and relieve stress. Therefore, it is a useful tool in helping mind and body to adapt with stress, anxiety and depression making the person feel relaxed and calm. In addition, yogic practices have proven to be very beneficial also in the treatment of dysmenorrhoea. Apart from increasing the circulation to the reproductive organs, they increase the flow of vital energy to these organs and establish a balance among hormones regulating menstruation. Yoga can prevent and treat diseases by using the energies inside the body, improving the circulation and waste disposal thereby cleansing the cells. Symptoms often co-occurring with menstrual pain include nausea , diarrhea or constipation, headache, dizziness, disorientation, hypersensitivity to sound, light, smell and touch, fainting, and fatigue. The release of prostaglandins and other inflammatory mediators in the uterus cause the uterus to contract: these substances are thought to be a major factor in primary dysmenorrhea. Several studies have shown that adolescents with primary dysmenorrhoea report that it affects their academic performance, social and sports activities and is a cause for school absenteeism. A study that involved 92 student girls ranging from 18 and 22 years old was carried out to assess whether three yoga postures (Cobra pose – Bhuganagasana – , Cat pose – Bidalasana – , Fish pose – Matsyasana) were able to reduce the intensity and the duration of menstrual pain. These three asanas (postures) were performed in the luteal phase of menstrual cycle for 20 minutes a day. This practice reduced the severity and the duration of primary dysmenorrhea and the study concluded that yoga can be an effective non pharmacological alternative for adolescents affected by menstrual pain. 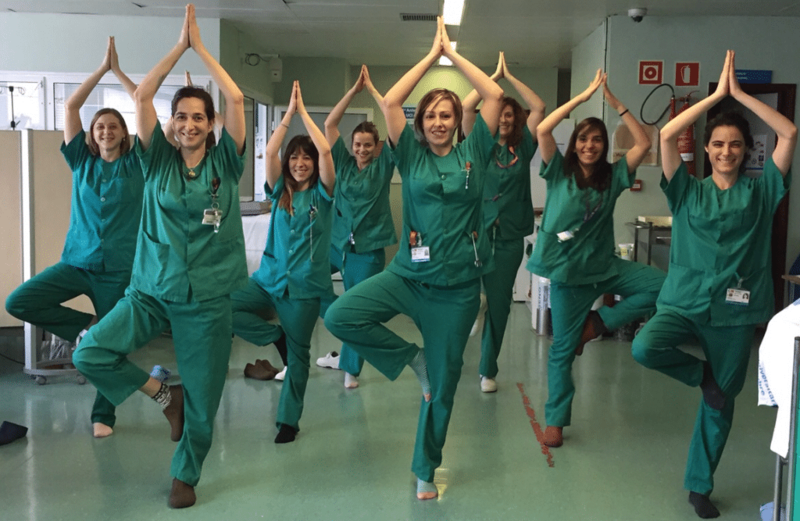 In another study, 60 medical students were asked to attend a 40 minute yoga class and a 10 minutes practice of meditation and pranayama (breathing control) every day over a period of 3 months. A study aimed to verify the efficacy of yoga Nidra for patients affected by menstrual disorders with somatoform symptoms. The results of the study indicate that somatoform symptoms in patients with menstrual disorder can be decreased by learning and applying a program based on Yoga Nidra. 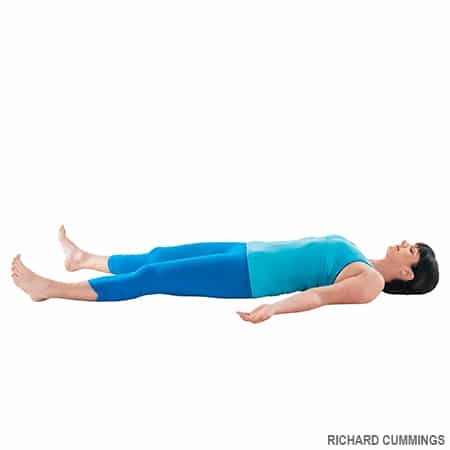 Yoga Nidra is a cost-effective and easy method to implement against somatoform symptoms. 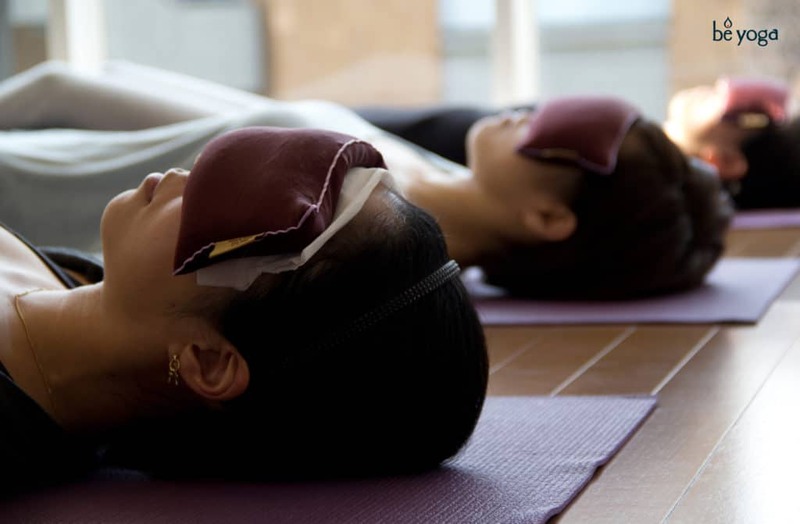 The study suggests that in patients with menstrual irregularities, Yoga Nidra not only has utility as a possible therapeutic strategy, but also may be a method for improving headache, dizziness, nervousness and irritability. Yoga Nidra probably relieves pain by stimulating the pituitary gland to release its own potent pain-suppressing compounds. Yoga Nidra is probably one of the best-known techniques to induce complete physical, mental and emotional relaxation. Yoga Nidra is a state of consciousness which is, neither sleep nor awaken, neither is it concentration nor hypnotism. It can be defined as an altered state of consciousness. Through Yoga Nidra, powerful stimulus can be given directly to the pituitary gland to release endorphins and enkephalin, so that synthetic painkillers are not needed anymore. 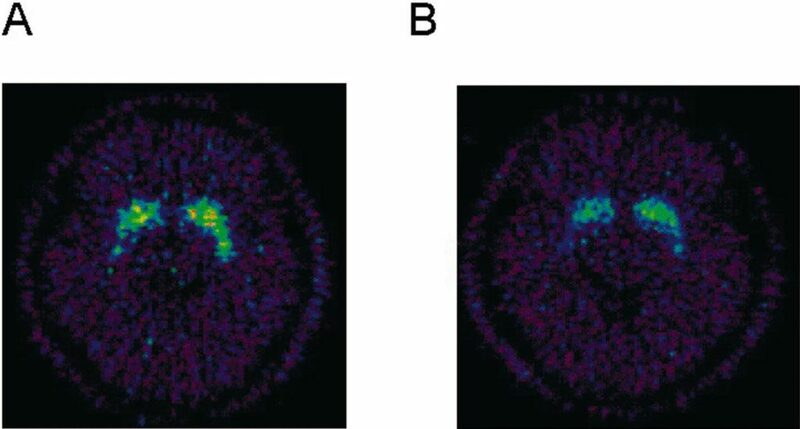 The 11C-raclopride binding potential images at the level of the striatum for one participant during attention to speech (A) and meditation (B). The reduced 11C-raclopride binding potential in ventral striatum is evidence of increased endogenous dopamine release during meditation. The Yoga Nidra study concluded that there was a significant improvement in pain, gastrointestinal, cardiovascular and urogenital symptoms after 6 months of practice of Yoga Nidra in the intervention group in comparison to the controlled one. To better benefit from the asanas, we suggest to follow the instruction of a certified yoga teacher or even better a certified yoga therapist. Asanas have to be performed in the right way and preferably following a specific sequence. Here follows a sequence directly studied by B.K.S. Iyengar for menstrual pain. For the naïve practitioners, most of these poses should be performed with the aim of some props like belts, blocks, blankets, bolsters or chairs. cautions: do not practice this pose between other asanas, this is the asana you will finish your practice with. Rakhshaee, Z. (2011). Effect of three yoga poses (cobra, cat and fish poses) in women with primary dysmenorrhea: a randomized clinical trial. Journal of pediatric and adolescent gynecology, 24(4), 192-196. Alvin, P. E., & Litt, I. F. (1982). Current status of the etiology and management of dysmenorrhea in adolescence. Pediatrics, 70(4), 516-525. Nag, U., & Kodali, M. (2013). Meditation and yoga as alternative therapy for primary dysmenorrhea. Int J Med Pharm Sci, 3(7), 39-44. Williams, K., Steinberg, L., & Petronis, J. (2003). Therapeutic application of Iyengar yoga for healing chronic low back pain. International Journal of Yoga Therapy, 13(1), 55-67. Manocha, R., Marks, G. B., Kenchington, P., Peters, D., & Salome, C. M. (2002). Sahaja yoga in the management of moderate to severe asthma: a randomised controlled trial. Thorax, 57(2), 110-115. Kronenberg, F., & Fugh-Berman, A. (2002). Complementary and alternative medicine for menopausal symptoms: a review of randomized, controlled trials. Annals of internal medicine, 137(10), 805-813. Oken, B. S., Kishiyama, S., Zajdel, D., Bourdette, D., Carlsen, J., Haas, M., … & Mass, M. (2004). Randomized controlled trial of yoga and exercise in multiple sclerosis. Neurology, 62(11), 2058-2064. Dauneria, S., & Keswani, J. (2014). A study on the effect of Yoga and Naturopathy on Dysmenorrhea. Editor’s Note. Looper, K. J., & Kirmayer, L. J. (2002). Behavioral medicine approaches to somatoform disorders. Journal of consulting and clinical psychology, 70(3), 810. Rani, K., Tiwari, S. C., Singh, U., Agrawal, G. G., & Srivastava, N. (2011). Six-month trial of yoga nidra in menstrual disorder patients: effects on somatoform symptoms. Industrial psychiatry journal, 20(2), 97. Kumar, K. (2004). Yoga nidra and its impact on student’s well being. Yoga Mimamsha, Kaivalyadhama, Lonavla, 36(1). Hallucinogenic substances: are they increasing creativity?